GYMPIE motorists benefited from the cheapest average unleaded petrol (ULP) price in regional Queensland in July according to RACQ’s monthly fuel price report. RACQ’s Renee Smith said Gympie was also the only regional centre that had an average price in July cheaper than Brisbane. “It’s great news for Gympie motorists that they’re seeing some of the cheapest ULP prices in the State,” Ms Smith said. Ms Smith said slightly lower than average retail margins in Gympie had helped drive the average price down. “We saw a ULP retail margin of just 8.6cpl in Gympie in July, compared to more than 10cpl in Brisbane and the Sunshine Coast. Motorists in places like Cairns and Innisfail further north are paying more than 16cpl,” she said. “We urge Gympie motorists not to get complacent though. People power is the only way we can keep prices in the area down. Ms Smith said Gympie also had the cheapest diesel in July (147.3cpl), more than seven cents per litre less than Brisbane (154.5cpl). 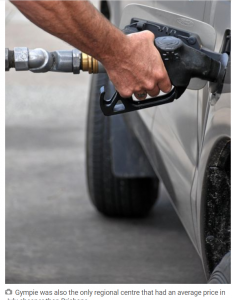 Read RACQ’s July fuel price report here.